British Airways to deliver significant changes to its First Class cabin as part of its £6.5bn investment. Dubai, UAE 13 March 2019: British Airways is set to deliver significant changes to the onboard product and service in its First cabin as part of its £6.5bn investment for customers. The new look and feel, set to take to the skies from March 31 will include new bedding, amenities and menus that would not look out of place in a revered five-star British hotel. The airline’s First customers will be offered super-soft, sophisticated new male and female loungewear designed exclusively by British fashion brand Temperley, London. 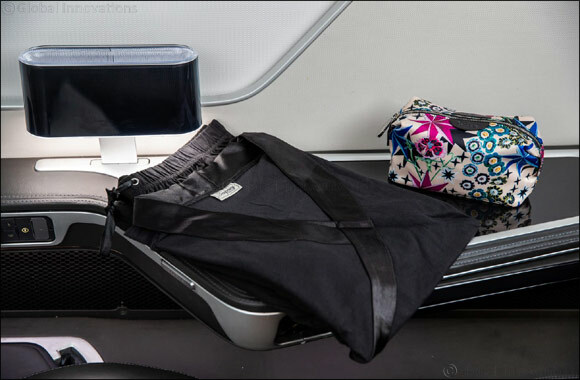 The loungewear will be coupled with bespoke British Airways amenity bags, featuring Temperley’s “Star” design. The bags will be filled with products from No 1 British Skincare brand, ELEMIS, including products from the highly sought after ULTRA SMART PRO-COLLAGEN range*. The amenity kit contains the essentials to cleanse, revive and hydrate. The airline’s chefs have also designed new delicious A La Carte menus that focus on fresh seasonal ingredients of British provenance. The new menus will be served on elegant bone china crockery, designed exclusively for the airline by high-end British tableware designer William Edwards. The new tableware will be accompanied by contemporary cutlery from Studio William. The airline will also be introducing a new signature afternoon tea service, showcasing the great British tradition of high tea. The menu will include a selection sandwiches, delicate pastries and scones, as well as a wide range of tea infusions. As part of the changes, British Airways is also investing in new Dartington glassware. Travellers will now be able to enjoy the airline’s fine wines and champagnes from sophisticated stemware, while soft drinks and spirits will be served from elegant cut-glass tumblers. Carolina Martinoli, British Airways’ Director of Brand and Customer Experience, said: “As part of our £6.5bn investment in customers, we’re changing parts of the travel experience in our First cabin. Our teams of designers, chefs and customer service experts have carefully thought through the details we know matter most to our customers. The airline’s First customers will benefit from an improved turndown service for the perfect night’s sleep, thanks to new luxurious 400 thread count bedding, accompanied by a foam fibre mattress topper. Customers will also receive a stylish new day blanket and bolster cushion. And those wishing to relax and enjoy the 1,000 hours of programmes available on the in-flight entertainment channels, can do so through high performance headphones crafted by Meridian, the British Pioneers of High Resolution audio. British Airways’ First customers continue to have access to the airline’s exclusive First Wing at Heathrow Terminal 5. Re-designed and unveiled in 2017, the First Wing provides customers with a private check-in area leading through to dedicated security lanes, which grant customers direct access to British Airways’ prestigious First Lounge. 2019 is British Airways’ Centenary year. The airline is investing £6.5 billion for customers over five years, including new aircraft, new cabins, new catering, new lounges, WiFi, and new routes.